When the Peace Corps called asking if I’d like to return to Dominica two months after Category 5 Hurricane Maria, I was at my parents’ house in South Carolina. Teaching ballet in the schools. I’d been following the updates on the island nation’s recovery and knew that most of the country was still without power, most schools had yet to reopen and that the Eden I had known and grown to love might never be the same. But I didn’t hesitate to say yes and the joy I felt seeing my ballet students again prevented any feelings of regret. 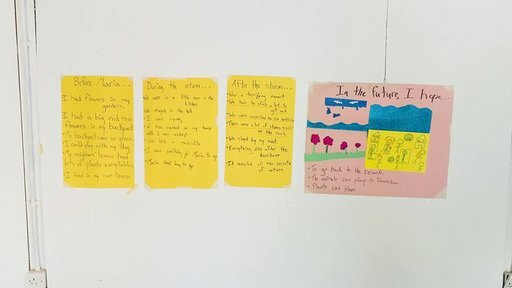 My first week back, we held a “return to dance” workshop in which participants wrote a poem describing their experiences before, during and since Maria. We recorded their voices reciting the poem and then they performed their own choreography to the words. Their stories were terrifying and unfortunately similar to those of many Dominicans who were here for the storm. One student huddled waist-deep in floodwater in a closet with her mother when the entire roof flew off and all they could do was wait for the storm to pass. Another had to wade across a flooded street during the eye of the storm to get to a neighbor’s house. My students' stories about Hurricane Maria. Many students had traumatic tales of what happened during the storm, yet it was the things that were missing they most wanted to talk (and dance) about. Many were staying with neighbors since their homes were unlivable. One girl never found her pet puppy. Another missed the flowers in her garden. And they all longed for the normal things: eating fruits, going to school and taking dance class. Despite the storm, my project hasn’t changed much since I first arrived in Dominica in January 2017 to serve as a Peace Corps Response Volunteer with the Dominica Institute for the Arts. I still travel to public schools for outreach classes every day and get to expose enthusiastic young people to the arts. I still train local performing arts teachers in classical ballet, and I still respond to “ballet teacher!” in the streets. Dancing in the studio before Maria. 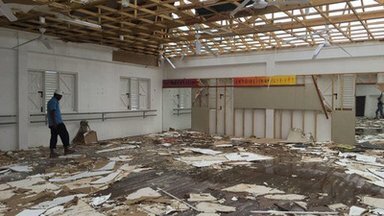 The dance studio after Hurricane Maria. My goal to help grow the Institute’s dance program, however, has been hindered by one major post-storm problem. When I first arrived, there was a big, beautiful dance studio converted from one of the buildings of the old sugar mill where the Institute is held. It was the only dance studio in Dominica and Hurricane Maria made it unusable. We have since been sharing the art gallery space for dance classes and while it is inspiring to be surrounded by artwork, it is not ideal. When students used to arrive in the dance studio, with barres and mirrors and a wooden floor, they felt they were part of something special. They had their own space to fulfill their dreams. That’s why I’m currently raising money through a Peace Corps Partnership Program grant to help rebuild the studio. There’s too much talent and too much passion for dance in this country to have no studio. The project above was funded through the Peace Corps Partnership Program (PCPP), which is a small grants program funded through private sector donations. PCPP funds volunteer–led, community initiated projects in all Peace Corps countries and sectors. Click here to learn more about PCPP. Rebecca Warthen is a Peace Corps Response Volunteer currently serving as a ballet instructor and teacher trainer in the Eastern Caribbean island nation of Dominica. She came to Dominica following her recent position as the Children’s Rehearsal Director of the Brooklyn Ballet, as well as her youth development work in Thailand with the Peace Corps and Save the Children International.